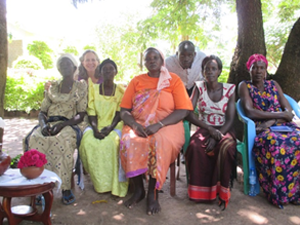 Professor Jenny Moore (third from left) conducted focus group interviews of women and men engaged in grassroots peacebuilding work in Uganda this summer. When people have experienced long-term violence and sexual exploitation, what are their perspectives on justice, reconciliation and accountability? These questions and more were the core of research conducted by Professor Jennifer Moore this summer when she went to Uganda. 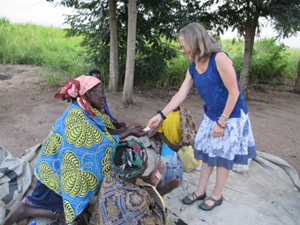 Moore’s work with refugees has brought her to Uganda several times, and this time she conducted focus groups of women from five communities in Uganda who lived through two decades of civil war atrocities committed by Joseph Kony and his Lord’s Resistance Army (LRA) as well as the Ugandan Army. The research is for a book that builds upon a vision of transformational justice focusing on the perspectives of non-elite women engaged in grassroots peacebuilding work. Human Rights Focus field officer Winnie Arima and Professor Jenny Moore in Kitgum after two long days of travel and interviews. 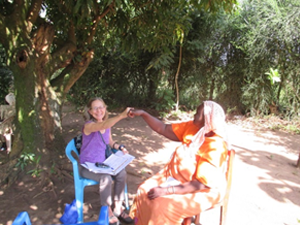 Moore and her translators drove an hour or two each day to a different remote village in a different sub-county of Gulu or Kitgum Districts. 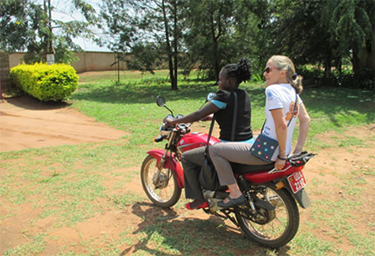 One day, she rode on a motorcycle (much easier on dirt roads) with her translator, Winifred Arima. In focus groups, Moore asked three questions centered on how each woman defines reconciliation, livelihood and accountability. In individual interviews, she delved more deeply into their lives and experiences – asking questions about their children, language, religion, education, access to health care, what they are most proud of in their community activism, if they regard the central government as supportive of their region, and more. Moore with Sister Rosemary Nyirumbe, one of Time magazine’s 2014 100 Most Influential People. 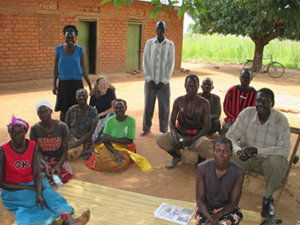 Moore’s first focus group was in Gulu Town, Northern Uganda (pop. 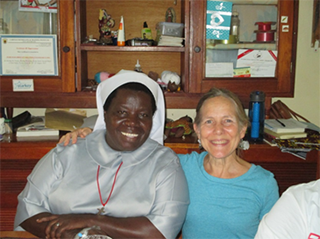 500,000), where she met with Sister Rosemary Nyirumbe (pictured at left). Sister Rosemary opened her school in Gulu to young women and their children returning from LRA captivity. Two of the women Moore interviewed went through her school and says that going to Sister Rosemary’s school was transformative in helping them reintegrate with their families and start independent life anew. In addition to offering schooling for young women and their kids, Sister Rosemary's pre-school and primary school is also open to the children of women incarcerated in the Gulu women's jail across the street, who attend for free. Kids under five are incarcerated with their mothers in Gulu prison. Yet during the day, they're ushered across the street, wearing the same school uniforms as the other students. 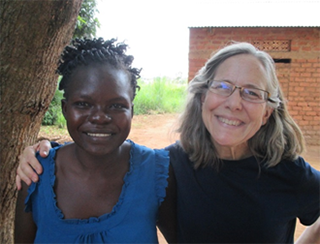 Moore with her translator, Winifred Arima, a field officer for Human Rights Focus in Kitgum. Moore’s translator, Winifred Arima, is the field officer and human rights monitor for Human Rights Focus in Kitgum. She is also a survivor of the civil war, during which her family was confined by the government to an internally displaced persons camp for nearly a decade. Moore was impressed that she attended Makerere University, Uganda’s largest institution of higher learning, on a full ride scholarship after studying for her exams in the evenings in Kitgum with gunfire all around. Victoria Nyanjura, of the Gulu-based Justice and Reconciliation Center, works to help women abducted by the Lord’s Resistance Army during the civil war to reintegrate with their families and communities. She served as Moore’s translator and facilitator in Gulu. The interviews led Moore to understand two important points. First, many women believe that community reconciliation is the root of collective livelihood activities. In order to farm and work together, they need to be unified. Second, acknowledgement of wrongdoing and compensation is more crucial for most women than punishment of those who committed wartime atrocities. If the government would make a heartfelt apology for its role in causing and exacerbating wartime suffering and take the further step of compensating those who lost family members, land, or the ability to work, this would go a long way in creating a peaceful environment for the future of Uganda. 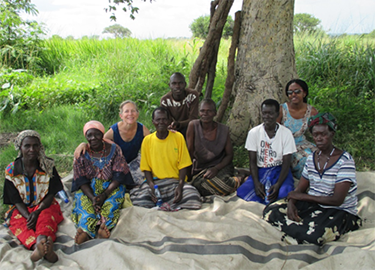 An article Moore wrote about the need for the type of comparative qualitative research on grassroots women's leadership in post-conflict recovery she conducted in Uganda was published recently. See “Engendering Peace and Justice after Armed Conflict: a Call for Qualitative Research among Women’s Community Networks” in The Occasional Paper Series – Volume II: Women and Transitional Justice - published by the Georgetown Women, Peace & Security Institute. Moore contributed her new member investment to the village savings and loan program established by the Alany pa Mony Lit women’s group. A celebration of solidarity with the Cultural and Historical Memory Center, established by the Uketu wan Kwene Women’s Group. Moore with women’s group "Uketu wan Kwene" - meaning "Where Will You Put Us" - composed of family members of individuals who were disappeared during the civil war. Moore with the Gwoko ter Kwaro ("Keeping the Culture") Focus Group, composed of women and men engaged in community development activities.